Better Life Maids Jacksonville arrives in Florida to provide high quality green house cleaning services and Better Life natural household cleaning products to Jacksonville and the surrounding communities. Better Life Maids green house cleaning has arrived in Jacksonville, Florida. Better Life Maids uses the entire line of Better Life natural household cleaning products, and has built a cleaning system from the ground up that is safer for their clients home, and for mother earth. Better Life Maids stated goal is to create a Wow! experience for their clients and now Jacksonville homes can experience the Better Life maids green cleaning difference for themselves. Better Life Maids Jacksonville is set to open late June of 2012. Better Life Maids is a fast growing green house cleaning franchise. Its co-branded retail partner Better Life has a line of natural household cleaning products that are sold coast to coast in stores such as Whole Foods. Together they are aiming to build the first national name brand in green house cleaning. The opening of Better Life Maids Jacksonville is a step in that direction. "I am very excited to help bring such a great business that helps families and the environment to Jacksonville," said Matt Henry a Jacksonville resident and Better Life Maids franchise owner. "Better Life Maids is all about providing its clients with a higher level of service, and the best in green products and services. Giving Jacksonville a choice for a greener, cleaner, and better home cleaning." Better Life Maids and Better Life have received quite a lot of attention lately. 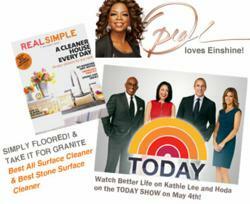 Better Life was featured on the Today Show, Real Simple Magazine, Oprah.com and many other national media outlets. Better Life Maids has been featured in Kiwi Magazine, Green Child Magazine, the St. Louis Post Dispatch, and many more media outlets. As Better Life & Better Life Maids grows their green house cleaning brand from coast to coast their are opportunities in hundreds of cities across the U.S. for prospective franchisees to own a Better Life Maids franchise of their very own. Better Life Maids is a green house cleaning service founded in St. Louis, MO. It has created a unique marketing partnership with Better Life a natural household cleaning products manufacturer. Together they are working to create the first national name brand in natural household cleaning products and green house cleaning services. Better Life Maids is expanding in select markets through a franchise development system. For more information visit http://www.betterlifemaids.com.